Since the release of iPhone last year, the dual-rear camera is quite a fashion this year. The Moto G5s Plus, a promoted version of the Moto G5, keenly makes this available in an incredibly budget-friendly phone. The phone comes with a 5.5 inches touchscreen display, 13 MP primary camera, 4 GB RAM, and 3000 mAh battery. A rear-mounted fingerprint sensor is supported by both G5s and G5s Plus. Fortunately for some and the opposite for others, the software and chipsets remain the same as of their predecessors. Check out the 10 best screen protectors for Motorola Moto G5s Plus in this list below! This is a pack of three full-coverage tempered glass screen defenders for Moto G5s Plus. The device’s Tru-Touch Technology makes it fully responsive. The oleophobic and hydrophobic coatings prevent the housing of dust, debris, scratches, daily wear, and tear. The premium quality ballistic tempered glass features a protective surface of hardness 9H. This screen defender is engineered meticulously without compromising the touch screen sensitivity and retina clarity. Your display is protected from scratches, scrapes, dust, debris, daily wear, and tear. Precise cutouts make it perfectly compatible with the G5s Plus. The rounded edges ensure proper and smooth installation. Remove dust and align properly. Improve gliding and grip experience with SLEO! Made 0.26mm in thickness, this defender by Wellci maintains the phone’s original response sensitivity and touch feeling. The oleophobic coating reduces smudges and fingerprints and ensures easy cleaning. The scratches up to 9H are effectively resisted. The 99.9% light transmission ratio is maintained. The defender is made with rounded edges to prevent edge chipping and enable case compatibility. Fingerprints and smudges get wiped away easily. This package comes with 3 screen protectors made fit only for G5s Plus. Your device is provided maximum protection from drops, scratches, and scrapes. The premium quality tempered glass with polished and rounded edges offer case compatibility and prevent edge chipping. The 99.9% transparency preserves the original screen brightness. Adheres to the phone’s screen without any gaps or bubbles, leaving the touch sensitivity unaffected. This is a pack of 6 screen defenders by Dmax Armor that is made easy to install and offer a bubble-free application. The film’s anti-glare matte technology disperses all the reflected light while protecting your eyes from damage. The film is made self-adhering which allows an effortless installation and leave no residue when removed. It is pre-cut to fit your screen exactly. The package comes with 2x lint-free microfiber cloths and an application card. This is a 9H hardness tempered glass screen defender by Wimaha that is made resistant to scratches, scrapes, fingerprints, and abrasions. The 2.5D rounded edges make the unit case compatible and prevent edge chipping. Seamlessly merges with the display and maintains phone retina clarity and touchscreen sensitivity. Exclusively designed for Motorola Moto G5s Plus, this is a 9H hardness tempered glass screen defender that is five times stronger than regular glass. The 0.3mm thickness film makes the unit almost invisible on the screen. The curved edges ensure proper installation and case compatibility. Your screen response and transparency are maintained well. Offers hassle-free and bubble-free installation and comes with accessories kit. 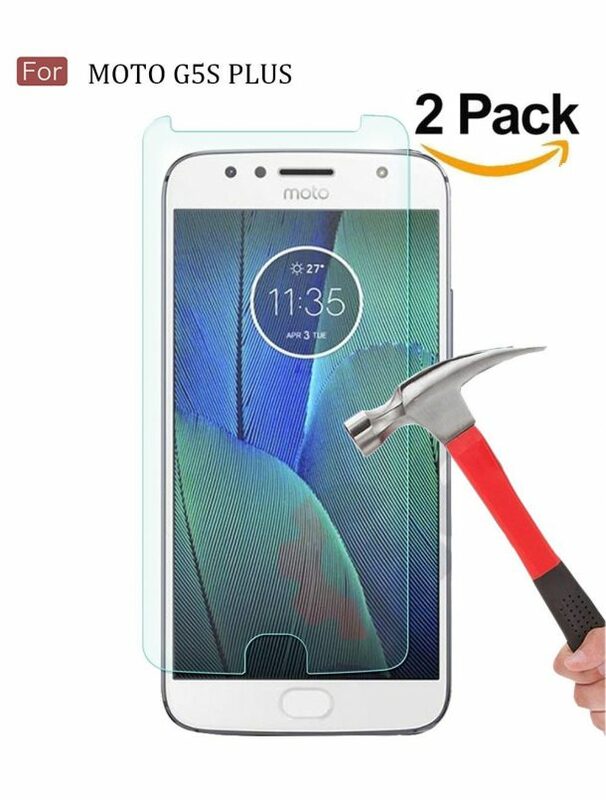 This 9H hardness tempered glass screen defender can effectively protect your Moto G5S Plus from accidental scuffs and scratches by knife, keys, and other sharp objects. Bubble-free adhesives make it easy to install. 2.5D rounded edges enable case compatibility and prevent edge chipping. The transparency provides you with the high-definition clear viewing experience. The hydrophobic and oleophobic screen coatings protect against sweat and oil residue from fingerprints while maintaining high-sensitivity touch response. Made from a high-quality easy-to-install film, this screen defender by Supershieldz has bubble-free adhesives as well. The glass features a hardness of 9H and measures 0.3mm in thickness. The unit maintains 99.9% high-definition clarity and touchscreen accuracy. The hydrophobic and oleophobic coatings protect against sweat and oil residue from fingerprints. The compactness offers no bulk to the phone. It is crafted with rounded edges for a comfortable grip. This package by Mr. Shield comes with 2x screen protectors, dust remover, alcohol prep pads, and bubble-remover. Your phone is protected from scratches to high impact drops and shocks. The unit is made reliable and resilient with a surface hardness of 9H. Precisely cut tempered glass with rounded edges offers an ergonomic user experience. The silicone adhesives allow for a smooth and bubble-free installation. We will appreciate your valuable feedback in the comment section below.